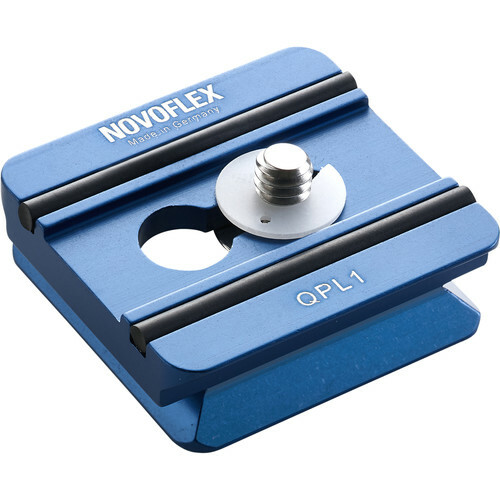 The Novoflex Q=Plate series QPL-1 square quick release plate fits any Arca-type quick release system (except the Arca Swiss Flip-Lock). It features a 1/4"-20 camera screw, on a 1.65" square plate that can slip in from any direction. Box Dimensions (LxWxH) 7.5 x 3.5 x 1.0"
Quick Release Plate for Q-Base System, 1.7" is rated 5.0 out of 5 by 4. Rated 5 out of 5 by Anonymous from Mounts compactly This is the only plate I could find which mounts on the Nikon 500mm f8 reflex lens and does not interfer with the camera body and battery pack. This allows me to attach the lens to the Wimberly gimbal head instead of using the plate on the camera body for mounting. The plate attaches securely to the lens foot and does not rotate when the camera body is in portrait mode though to be fair you can just rotate the lens collar for portrait mode or leveling the lens. Rated 5 out of 5 by Joseph C. from Good with Rollei Schneider AFD-Variogon I use this on the foot of my Rollei Schneider AFD-Variogon 60-140mm f/4.6 PQS medium format lens. The Schneider has a pre-tapped screw arrangement on the lens foot that was difficult to mate with a plate. The problem is that the 1/4-20 hole is too close to the 3/8-16 hole. I wanted to secure both to keep the plate from rotating. But the pan heads of any of the standard camera screws I had would overlap, so I had to rethread a smaller screw that I found. Anyhow this plate only includes the 1/4 screw, but it was my best option to add a quick release plate with my Schneider Variogon and also 300mm. Rated 5 out of 5 by Anonymous from Yes I would like to recommend! easy to use,can use coin to tight the screw. Are the Novaflex Q-mount plates compatible with Arca-type heads? Thank you. Yes, they are arca type plates. Does the Peak Design plate (PROplate from the discontinued Capture PRO) fit this Novaflex Q-mount quick release system? Unfortunately not. Peak Design requires their own plate.